Individuals in the public and private sectors realize that manufacturing is an area of critical national importance and they have come together to support, promote, and accelerate innovations in the sector. One of the areas of focus with increased research and development is in advanced robotic manufacturing (ARM). The Department of Defense (DoD) is stepping up this initiative by awarding the 14th Manufacturing USA institute to American Robotics, Inc. Known as the Advanced Robotics for Manufacturing (ARM) Institute, it is headquartered in Pittsburgh, Penn. The institute is a consortium of state and local agencies, and industrial and academic partners from 31 states. The ARM Institute private partners contributed $173 million in cost-sharing to fund operational costs, which was matched by $80 million in federal funding. This public-private partnership reflects the importance of advanced robotic manufacturing as a competitive advantage of U.S. manufacturers. While robotic technology has been around factory floors for decades, the cost and complexity of its use often deprives small and medium-sized manufacturers from implementing this technology. As the newest member of Manufacturing USA, a program of public, private and academic participants investing in the development and use of cutting-edge manufacturing technologies, the ARM Institute is comprised of 123 industrial partners, 40 academic partners, and 64 government and nonprofit partners. These growing numbers will, ideally, encourage more participation in the brewing ARM revolution in the robotics sector. In a press release, the Association for Advancing Automation (A3) reported a record growth in the robotics area during the first half of 2017. About 19,331 robots worth more than $1 billion were sold in North America, representing a growth of 26% in U.S. dollars over 2016. The report adds this development had a domino effect on complementary technologies, including motion controls, actuators, sensors, and AC drives. This peripheral market realized a remarkable $1.62 billion revenue during the same period, up by 14% over the first half of 2016. Small and medium-sized manufacturers are encouraged to join the ARM Institute. It is a conducive technology hub that can help spur new innovations by providing common facilities to small manufacturers and local start-ups in the aerospace, electronics, automotive, textiles, logistics, and composites sectors. The institute also serves as a teaching-and-learning factory to develop new skillsets and innovative approaches previously available only to large enterprises. These benefits help to encourage further investments and increased production through shared advanced robotic manufacturing capabilities and performance metrics, and help to stimulate growth and profitability in SMMs. The impact of robots on the human workforce is a hotly debated topic. While critics within the business community still view robots as a replacement for human labor and jobs, there are also indications that technological advances help to create jobs, according to IEEE senior member Kevin Curran. He adds that automation helps to eliminate low-skill occupations while also creating entirely new skillsets. While robots have already taken over highly repetitive jobs, robotics advocates take comfort in the thought that advanced automation arguably won’t lead to massive unemployment. The benefits of adopting modern automation technologies can be felt in particular by small and medium-sized organizations. Cobots, or robots that work collaboratively with human counterparts in a shared workspace, can improve the daily functions of small or medium-sized manufacturers and save them money both up front and in the long term. Because cobots work in the same space as people, rather than requiring separate, secured areas in which to operate, they ultimately can help to reduce costs over the use of traditional robots by saving valuable floor space and eliminating the need for fences. Moreover, according to Barclays Equity Research, cobots sold on average for $28,177 per unit in 2015 and costs are expected to continue to decline by 3-5% per year through 2025. They also are flexible and can be reprogrammed easily, making them valuable assets that can be used to accomplish a greater variety of skilled and multi-step tasks. 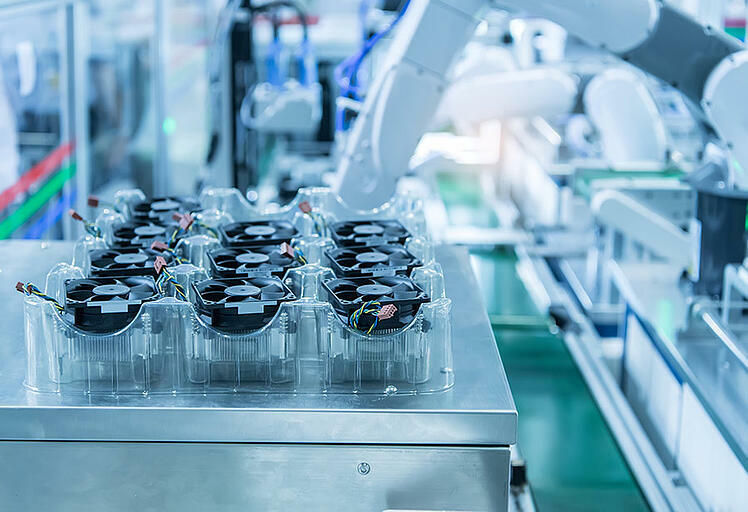 By incorporating cobots into their manufacturing operations, small and medium-sized organizations can strive to enhance their manufacturing capabilities and increase their overall productivity and growth. By embracing these innovative new technologies, they will be a part of the revolution.